Herefordshire trainer Kerry Lee has had plenty of jockeys ride for her since taking over her father Richard's yard near Presteigne in 2016. But she will find out herself just how tough it is when she rides in the St Michael's Hospice Charity Flat Race at her local Hereford track on Tuesday. "I don't think anyone I spoke to said this was a good idea. "But I've always had huge respect for jockeys riding in races," 40-year-old Lee told BBC Hereford & Worcester. 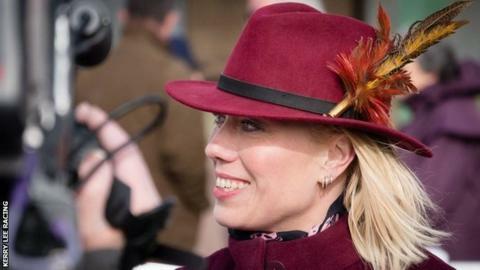 Lee's time in the saddle began at the same pony club as her Herefordshire neighbour Richard Johnson, British racing's champion National Hunt jockey for the past three years - and well on course for a fourth title. "I've never previously much wanted to do it myself," she said. "But this is a positive day for a positive cause. "This was just something I now wanted to do. It was a great opportunity to raise money for a great cause and challenge myself at the same time. "A mile and a half might not sound much but, when you run round the Hereford track as I've done, it's a lot further than you think." The St Michael's Hospice Charity Race is the last event on Tuesday's card at Hereford (17:00 GMT). Lee will ride one of her most successful horses Top Gamble, one of four mounts she has running in the mile and a half flat contest. "I've had to get myself properly fit to raise as much as money as I can," she added. "It's giving care to people with a terminal illness and that's something you can't put a price on. "I've kind of had to train myself like a racehorse, going up into the woods and running up and down the gallops and even round the racecourse. "I've been to fitness classes, I've been to the gym when it was dark and miserable in the evenings and I've even been cycling to and from work a bit. "I've thrown everything into this. I've bombarded all my friends on Facebook, Whatsapp and emails and I've had a huge response. Colleagues, owners and even people I don't know."